The United States Environmental Protection Agency awarded an Environmental Merit Award to Encore Boston Harbor in recognition of their construction of a living shoreline and efforts to protect the local environment. Encore Boston Harbor was nominated for the award from the Mystic River Watershed Association and the City of Everett. Windy Pham (Encore), John Tocco (Encore), Patrick Herron (MyRWA), Chris Gordon (Encore), Natalie Brown (Encore) and Tom Philbin (City of Everett) at the Environmental Merit Award Event. Encore Boston Harbor, a resort and casino in Everett, completed a $68 million cleanup and restoration at the former Monsanto chemical factory site. The work involved cleaning soil, dredging contaminated sediment and creating a living shoreline along the Mystic River. When the casino licensing process began, the Mystic River Watershed Association asked applicants what they would do for the local environment. It asked Encore Boston Harbor if it would replace the planned sheet piling with a living shoreline. The company promised to take care of all soil contamination on site, revegetate the shoreline and completely clean the sediment. They have since removed some 840,000 tons of contaminated soil and 41,000 tons of sediment, brought in 30,000 clean tons of sand for capping contaminated sediments and created a 24,000-square-foot living shoreline. Encore is installing a co-generation facility, rainwater harvesting, a green roof and solar panels. An additional $14 million will go towards landscaping and beautification of the the six-acre Encore Harborwalk Park, which will be open to guests and residents and provide shoreline access to the public for the first time in over 100 years. 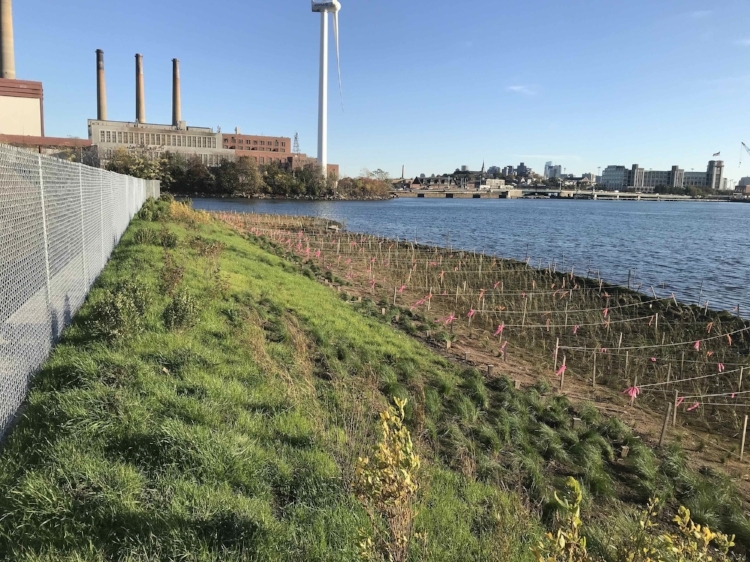 To build on this restoration, the Mystic River Watershed Association is now collaborating with the Massachusetts Department of Conservation and Recreation to build a living shoreline across the river in Somerville.